Heat is the number one weather killer, making Wednesday's heat extremely dangerous, especially if you have to spend a lot of time outside. 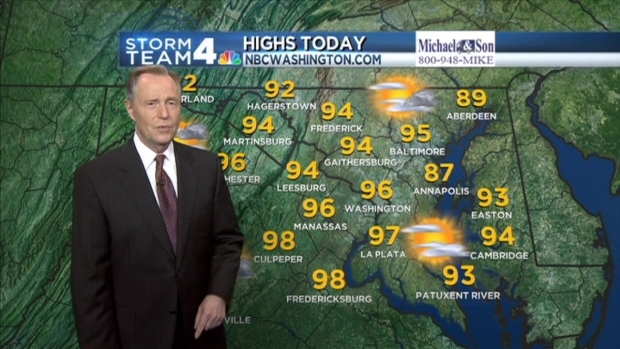 It will feel like 100 degrees or higher when you step outside, thanks to the steamy humidity and a high of 96 degrees. But there are some ways you can protect yourself. While staying indoors is an obvious way to minimize your exposure to the heat, you can also minimize how much sun beams down on you by dressing for the weather. Wear loose-fitting, lightweight, lightly colored clothing. Storm Team4 Meteorologist Tom Kierein has the forecast for June 18, 2014. If you must be outside, remember to also take frequent breaks and avoid the sun's peak hours between 11 a.m. and 3 p.m.
Dr. Bill Frohna with MedStar Washington Hospital recommends scheduling water breaks to keep yourself hydrated. "Sometimes you just need to have a scheduled water break, even if you don't feel thirsty. In part, that's because one of the signs of heat injury may be nausea and you don't feel thirsty, so a scheduled water break is a smart idea," Frohna said. When air quality is poor and temperatures are high, stay indoors and enjoy the air conditioning. If you don't have air conditioning, find your nearest cooling center. It takes only 10 minutes for a car's interior to reach 90 degrees on an 80-degree day -- even with the windows rolled down two inches. After 30 minutes, the interior temperate will reach 114. And after an hour, a car's inside will top 123 degrees, says SaferCar.gov. Leave anything you normally need (such as your purse, wallet or cell phone) in the back seat). Keep a large item, such as a stuffed toy, in your child's seat when he or she isn't there. Keep the item in the front seat when your child is in the back. Check your back seats every time you leave the car. Arrange to have your child's daycare, babysitter or school call you if your child doesn't arrive. If you're dropping off your child but your partner normally does it, have him or her call you to make sure the drop-off went according to plan. Teach your children never to enter or play in a parked vehicle. Heatstroke can occur in weather as low as 57 degrees, and children's body temperatures rise faster than adults'. Never leave your child unattended in a vehicle, even for a minute.